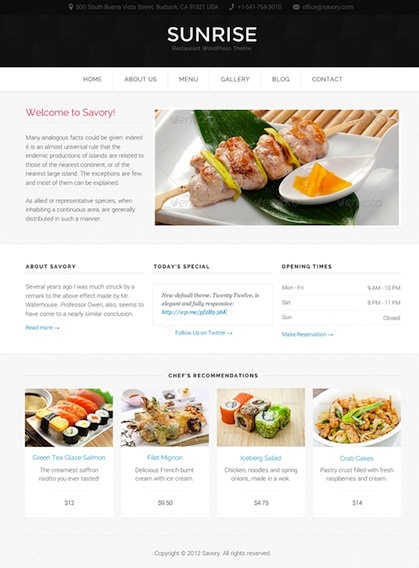 Savory is a responsive WordPress theme for restaurants, diners, bars, pzzerias, coffee shops, etc. The theme comes bundled with the Retail Menu Cards plugin, allowing you to easily create menus using an interface you’re already familiar with. The key to building an good restaurant website is keeping things simple. Menu, contact information, map, opening hours, maybe some daily specials. These are the things your users want and Savory gives you the tools to easily set everything up with a few click or using drag and drop widgets. You can choose from one of 3 unique skins (Modern, Rustic, Classic), add your own logo and colors.